Best Electric Shaver For Women 2018: Even though going fuzzy is becoming a revolutionary statement for women around the world, the fact is that most of us are slaves to the trends that fashion magazines dictate. Over the last half-a-century, this has meant maintaining an almost impossibly clean and smooth appearance of the skin. Needless to say, hair removal brands are not running out of profit anytime soon, but the consumer is often left disgruntled by the choices they have to make. Even more disappointing is that no matter how hard you try, hair removal is not a permanent stint, and those methods that promise such impossible results often end up causing serious damage to the skin. This leaves most of us to resort to what happens to be the most convenient option- the trusty shaver. If you have been looking for a brand to trust for the best results in shaving, this guide to buying the Best Electric Shaver for Women is for you. Why opt for shaver when you have creams, lotions, waxing, and of course, laser? The reason is fairly simple. Shavers are inexpensive, more efficient, and do not cause any skin damage, other than the few nicks and cuts that you have to suffer if you are careless, but these chances are further reduced when you have the best electric shaver for women at your disposal. You can use them every day if you want hair removal with minimal chances of irritation, for the effects are but temporary. On the plus side, you can forever bid adieu to the pain that is generally associated with hair removal. Here are some of the options you may consider for the Best Electric Shaver for Women. Our first option is from Braun’s widely trusted Sil-epil line, which has been associated with the best in shaving for a long time. There are a lot of things to be loved about the LS5160WD, but we will start with the most important bit- shaving efficiency. This compact electric shaver for lady comes with a rounded tip equipped with blades that can cast away hair as small as a quarter of an inch. For best results, it can be used in both wet or dry conditions, so us it in and out of the shower as you please. What we like best is are the results, the smooth aftermath not to be credited to the blades alone, but to the included exfoliator that helps you achieve smoother skin without an additional action. But if you have super sensitive skin, then you are probably better off without this attachment. The Braun LS5160WD’s body has been designed ergonomically, which results in a compact size that fits easily into one hand for an optimum experience. You can use the other hand to pull your skin taut while shaving. Also, the rounded head slips into curves without any added pressure. The additional bikini attachment also lets you keep you looking effortlessly clean during summers. Verdict: If you are looking for a very close shave for everyday use, then the Braun LS5160WD may not be your best choice. However, we found that this electric shaver for women worked wonders for touch ups in the underarms and bikini areas, both pretty difficult to get right. We also like the exfoliation attachment, which works fine if you do not tend to break out in rashes after a shave. Most of all, it is compact, lightweight, and really easy to maneuver. If your hunt for the best electric shaver for women has left you perplexed and dissatisfied, then the Philips SatinShave Prestige Wet & dry cordless Women’s Electric shaver is a must try. While it is an incorrect conception that the best electric shaver in the opinion of one woman will work for another, the reputation of this particular model suggests that it works for almost everyone. And that includes our team. This wet and dry shaver can be used in the bath and out of it without causing any skin irritation, and the sophisticated shaver head provides a close, comfortable shave while reaching in the most difficult areas without any problems. Moreover, there are different settings that work well for different areas. The flexible head and the pearl-tipped trimmers make sure to achieve the desired results without having leaving any redness behind. Moreover, there is also cushioning on both sides of the shaver to make your shave more comfortable. There is a trimmer onboard too that can be used with ease around the bikini area. This is a rechargeable model which does not have you scramming for batteries in the middle of a session. Verdict: The Philips SatinShave Prestige Wet & dry cordless Women’s Electric shaver is definitely the best electric shaver for women out there, and you can find thousands of testimonials to prove the same. The rounded head makes for a smooth and easy shave, and the cushioning actually helps in the process, rather than being just a gimmick. The rechargeable action also makes it among the best, as it makes for an uninterrupted shave. 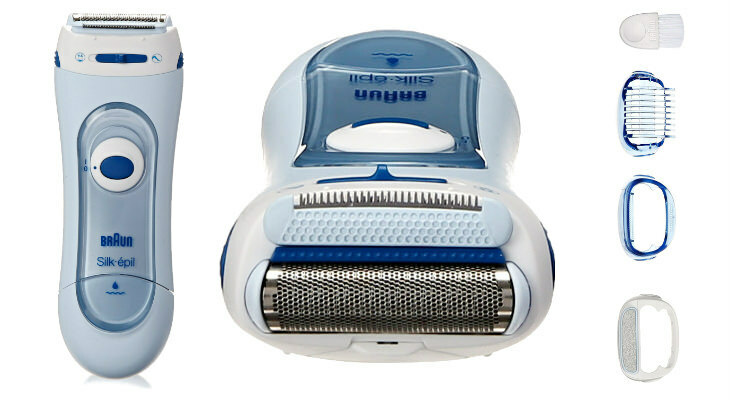 The Panasonic ES2207P Ladies Electric Shaver is made unique by the presence of a triple blade head, and instead of locating the blade at the top, it is housed at an angle. This makes holding the shaver with one hand and using it on your arms, legs, and any other areas incredibly easy. The blades are made from a hypoallergenic material, which makes it easy to shave dry without having to worry about a bumpy aftermath. Although the color combination is a little predictable, the overall design has been kept ergonomic and easy to fit into one hand. Besides using it dry when running short of time, you can also use this best electric shaver for women in the bath or the shower, which we have to admit, results in far more efficient shave than dry conditions. To make your dry shaves even better, you can also use a lotion. What you will love about it the most about this durable electric shaver is the powerful motor, which goes on and on without any trouble. That also translates to a long-lasting shaver overall, which is one of the best deals that you can hope to get at its price. Some other highlights are that it is easy to clean, and comes with a compact charging unit. 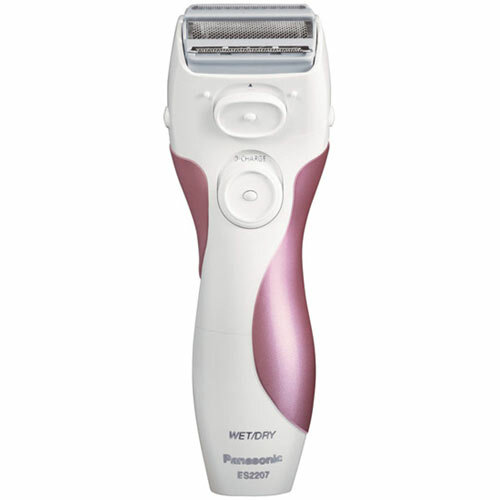 Verdict: If you are looking for a powerful electric shaver for women for legs, then the Panasonic ES2207P Ladies Electric Shaver will meet your stringent demands. It helps that compared to other shavers in its price range, this one is extremely long lasting, and some users have reported that a single unit has lasted them years. If that it the case, then one should hardly mind having to replace it when the time comes. We just wish that it came with a dedicated bikini setting that would chafe a little less. 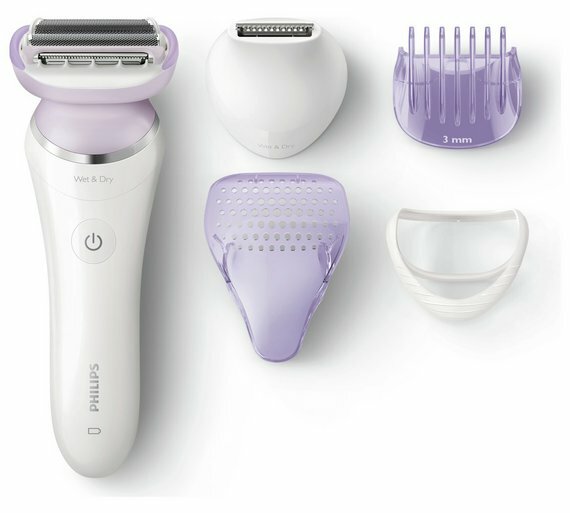 The Richoose Electric Shaver for women resembles one of the Braun epilators manufactured particularly for use on the face, and functionality wise too, it is akin to that. Not that we ever recommend using a shaver on the face unless you want to flaunt a stubble, but this compact hair remover is fantastic for use on the smaller, more difficult to reach areas on a woman’s body. For the best results, you can use it on your underarms and bikini areas, which, thanks to its small rotating head, end up churning our great results. You can use it to clear up certain parts of your arms and legs in the aftermath of a waxing miss, but we do not recommend using it to work your entire legs or arms. This can both damage the shaver and cost you a lot of time. This is a battery powered shaver, and although we prefer rechargeable units over this kind, the limited use you will be putting it through means getting more life out of the batteries. The Richoose Women’s Painless Hair Remover is also very travel-friendly, thanks to its compact cylindrical shape, and the click cap that covers the head to keep it from causing damage to the contents of your handbag. Verdict: If you are looking for the best electric shaver for bikini and underarm shaving, then the Richoose Electric Shaver for women warrants a trial. This inexpensive shaver works great where other shavers with wider heads end up failing, and the fact that it can provide a really comfortable bikini shave is one of its biggest positives. If you already own a shaver to do your legs and arms, you can buy this as an additional accessory for specific body parts. You won’t regret it. Most people who count on electric shavers for their daily grooming needs swear by Remington, and for good reason too. The Remington WDF5030A Wet & Dry Women’s Rechargeable Electric Foil Shaver gives you yet another reason to rejoice. Equipped with a unique open blade system, this shaver has its head angles optimally just like the Panasonic unit listed on this list, thus providing an exemplary shave that stays the same even over time. The dual-sided Flex trimmers also help in giving the hair that you want to shave a direction so that shaving becomes easier. add to that the company’s proprietary Lift Logic foil system, and you won’t see any hairs escaping the action of this best electric shaver for lady. The smooth glide technology also helps it get into the contours to provide an optimum shave. The anti-microbial shield and almond oil strip helps protect against irritations, and the soft touch grip allows for a slip-free hols while guiding it all over the body. The best part, however, is that it is one hundred percent waterproof, which makes cleaning it or using it in the bath a breeze. It is definitely on the expensive side, so if you are not quite ready to shell out this much money for a shaver, then you have our other recommendations to consider. 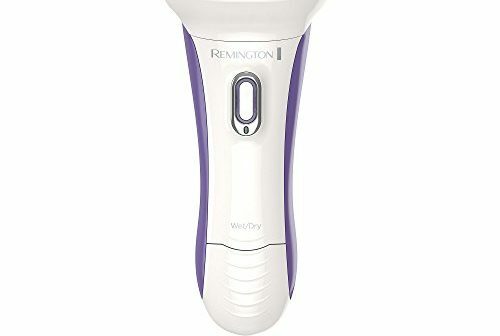 Verdict: The Remington WDF5030A Wet & Dry Women’s Rechargeable Electric Foil Shaver can best be described as an intelligent device that does everything in its power to ensure complete freedom from fuzz, just about anywhere on your body. It provides a completely painless alternative, as we experienced zero injuries while using this. On the flipside, we feel like it could benefit by being a little more compact. It’s a little difficult to carry around in your handbag alongside everything else. Unfortunately, women’s shavers do not belong to as thriving a market as their male counterparts, and the multiple options for hair removal that are available (which are often painful) are to blame. But of you have decided to skip the reign of pain and opt for a better, safer way to remove your body hair, then our list of the best electric shaver for women is the one to look at for guidance. We sincerely hope that you find what you are looking for in here. And do not forget to let us know how you like using it. Have a favorite that we have not mentioned? Do not hesitate to let us know.